Day 1 : Casablanca / Rabat Arrival at Mohammed V Airport in Casablanca. Welcome & assistance Departure to Rabat Dinner and accommodation at the hotel. Day 2 : Rabat/Chefchaouen Breakfast at the hotel. 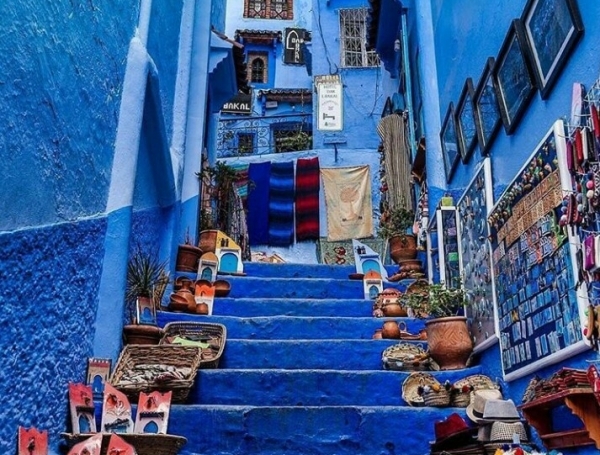 Visit of Hassan Tower and Mohamed V Mausoleum then continue to Chefchaouen as it is often called by Moroccans. It was founded in 1417 by Moorish and Jewish refugees who fled from Spain. 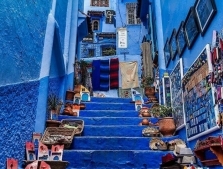 Free lunch, then visit of the medina of Chefchaouen with its narrow winding lanes and its various shades of blue. Dinner and accommodation at the hotel in ancient medina. Day 3 : Chefchaouen/Fez Breakfast at the hotel. Departure to Fez, Imperial City, dated back to the eighth century. Free lunch, visit medieval medina of Fez classified as World Heritage by UNESCO visit the fabrication of leader and bronze, the Nejjarine Square. You will also see from outside the Mausoleum of Idriss II and the fabulous Quaraouine mosque. Then visit of Royal palace gate of fez and Fes El jdid (new city). Dinner and accommodation at the hotel. Day 4 : Fez/Ifrane/Erfoud /Merzouga Breakfast at the hotel. Early departure (in order to enjoy the sunset in Merzouga) for Midelt through the mountains and the cedar woods of the middle Atlas. You will pass by Ifrane, a charming ski resort. Short stop to take photos with the lion statue and continue via Azrou an important handicraft centre specialised in the work of cedar wood. After the Zad pass (2,178m), you will arrive in Midelt for free lunch then continue to Merzouga via Erfoud, an oasis town in the Sahara Desert. 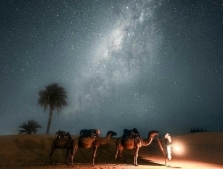 Merzouga is known worldwide for its sunrise and sunset, its luminosity and very pure landscapes. A camp is set up around a campfire where you can have camel riding (45 min maximum) to enjoy the sunset then a traditional Berber dinner. Day 5 : Merzouga/Tinghir/Boumalne Ddades /Ouarzazate Breakfast at the hotel, then drive to Ouarzazate via Tinghir one of the most important cities in south Morocco. Arrival to the spectacular Gorges of Todra, canyon in the eastern part of the High Atlas. Free lunch Continue on to reach Ouarzazate via Boumalne dades and Kelaa M'gouna (Valley of the Roses) Dinner and accommodation at the hotel. Day 6 : Ouarzazate /Ait Ben Haddou/Marrakech Breakfast at the hotel. Optional visit of the Kasbah Taourirt, considered to be one of the most impressive structures of its kind. Departure to Marrakech via the Kasbah town of Ait Ben Haddou which, at a height of 1,160m, stands in stark contrast to this vast plateau. Originally a crossing point for traders crossing the Sahara Desert, this UNESCO world heritage site is equally recognized as the location for films such as ‘Laurence of Arabia’ and ‘Gladiators’. Visit to the Kasbah and the fortified village. Continue to Marrakech via Tizin Tichka , peaking at 2260 meters, one of the most beautiful roads in Morocco that offers a magnificent view of pure and mixed nature. Dinner and accommodation at the hotel. Day 7 : Marrakech Breakfast at the hotel, You will start a historical visit of the principal monuments of Marrakech. You will stop before the famous Koutoubia, a demonstration of Hispano-Moorish art that has a 70m minaret, The Bahia palace ( fees not included) decorated with exceptional cedar wood and The Saadians tombs (fees not included), date back from the time of the sultan Ahmed al Mansour (1578- 1603). The tombs were only recently discovered (in 1917) and were restored by the Beaux-arts services. Free lunch, visit of the souks sources of temptations, regrouping different works and business: Cabinetmakers, ironware merchants, boiler makers. 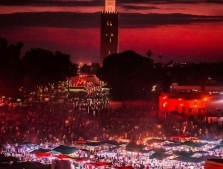 Then the visit continues to the famous Jamâa El fna square known to be a place of public execution until last century. Today it provides constant ever changing entertainment, which is more alive in the sunset and continues late in the night. The square is centre for public meetings and even riots, where story tellers, snake charmers, acrobats, folkloric bands, etc... are operating daily. MAIN RESOURCES: Phosphate and its derivatives (27% of exports), but also on agri-food products (agriculture employment almost half of the active population) and textiles, tourism and handicrafts. Morocco imports industrial equipment (transport equipment, telephony, data processing). Morocco is the fifth largest economic power in Africa. GEOGRAPHY: Morocco is a country in north-west Africa. Its long coastline overlooking the Atlantic Ocean ends beyond the Strait of Gibraltar on the Mediterranean. CLIMATE: The Moroccan climate is both Mediterranean and Atlantic, with a warm dry season and a cold, wet season, with the end of the hot season marked by the October rains. In the interior, the climate varies according to the altitude. The summers are hot and dry, especially when the hot wind or chergui blows, summer wind coming from the Sahara. 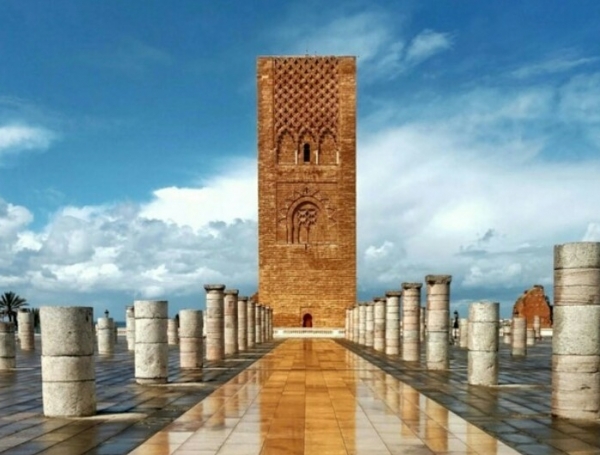 In general, the climate in Morocco can be divided into seven subareas, determined by the different influences that the country undergoes: oceanic, Mediterranean, mountainous, continental and Saharan influences. FAUNA AND FLORA: Morocco still has an important wildlife, which testifies to the traditional sustainable practices and the careful management of the resources, transmitted from generation to generation. Today, Morocco has 40 different ecosystems providing a habitat for many endemic species, including rare plant and animal species. SHOPPING: Whether it is to find works of art or to buy spices and slippers, the Moroccan medinas have been, for centuries, unmissable appointments. Everywhere you will find spices, fabrics, pottery, leather, silver jewelery ... but some regions have their specialties: Chefchaouen (woolen covers and fabrics), Tangier (silver jewelry and antiques), Meknès, Taroudant and Tiznit (Silver jewelery), Fez El-Bali (leather, ceramics), Essaouira (objects made of raffia and wood). If you already have an account, please login clicking here.